The things that make this smartphone differ from other smart ones is its fully waterproof design, clamshell phone running Android 2.3 Gingerbread OS, ability to end a phone call by slapping the clamshell shut, an impressive 16 Megapixel rear camera. So now you think that it is some what different. So lets look into its other features. The Aquos Hybrid 007SH comes with a 3.4 inch WVGA 3D New Mobile ASV touchscreen which is kept underneath one of its swiveling, flipping halves.The other pannel has a numeric keypad and a directional pad. It is powered by a 1 GHz processor, a front-facing camera and 3D display support. The rear camera is capable of recording videos at 720p with the 3D photo and video capability. The waterpoof is of either IPX5/IPX7. It comes with AQUOS TV connector, WiFi, Bluetooth, and Android 2.3 (Gingerbread), digital TV tuner, digital wallet function, Blu-ray recorder connectivity, infrared port, and W-CDMA and GSM. The Hybrid 007SH is certified for the DLNA® (Digital Living Network Alliance) home network standard, users will be able to, for example, watch content from AQUOS TVs or Blu-ray Disc recorders wirelessly on their AQUOS PHONE. 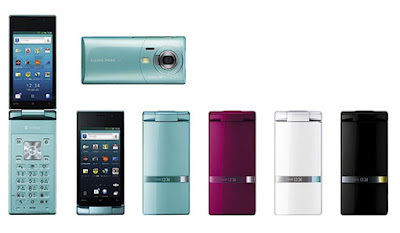 It has a high-quality graphics engine incorporating the image-reproducing through its AQUOS LCD TVs.This engine utilizes image sharpening technology, which gives extremely naturally renderings of the borders and contours of images, and color adjustment technology, which adjusts color intensity and brightness, to give users high-quality images of mobile device broadcasts, Internet videos, and content from AV equipment over DLNA networks. The Sharp's Aquos Hybrid 007SH is available in Japan by mobile carrier SoftBank in mid-June and later available internationally.Currently no news about its price. Tags:Sharp's Aquos Hybrid 007SH, Sharp's Aquos Hybrid 007SH fetures, Sharp's Aquos Hybrid 007SH specification, Sharp's Aquos Hybrid 007SH availability, Sharp's Aquos Hybrid 007SH review, 16 MP camera phone, fully waterproof phone, clamshell phone running Android 2.3, Android 2.3 Gingerbread.